Errol: Darn it, I never got a chance for Kari to edit this, so if there are all sorts of errors, you must forgive me. Hopefully, I can finish a bunch of them today! Oh man, how are YOU guys doing on your novel. This entry was posted in 2014 and tagged jen, rob. Bookmark the permalink. Currently sitting at almost 1k, with plenty of day still to go, even with a short work shift this evening. I’m working with what I’ve affectionately called a NaNoDilemma. If I want to get 50k, I’ve got to do it in ten days. I’m a little sluggish at 800, but still typing ahead. I’m happy, I’m already at 1800, need that Rob suggested buffer though! 869 so far today! How are you doing on the comics? Hugs on the insanity this month! I wrote 3500 before I went to bed at 4 a.m. Saturdays with no morning plans are always my best from during NaNo. The house is so quiet! Just over 1,000 words I hope I can work on my good ol story tonight after movie night with my other writing freak friend. BTW…started behind, too much to do today. 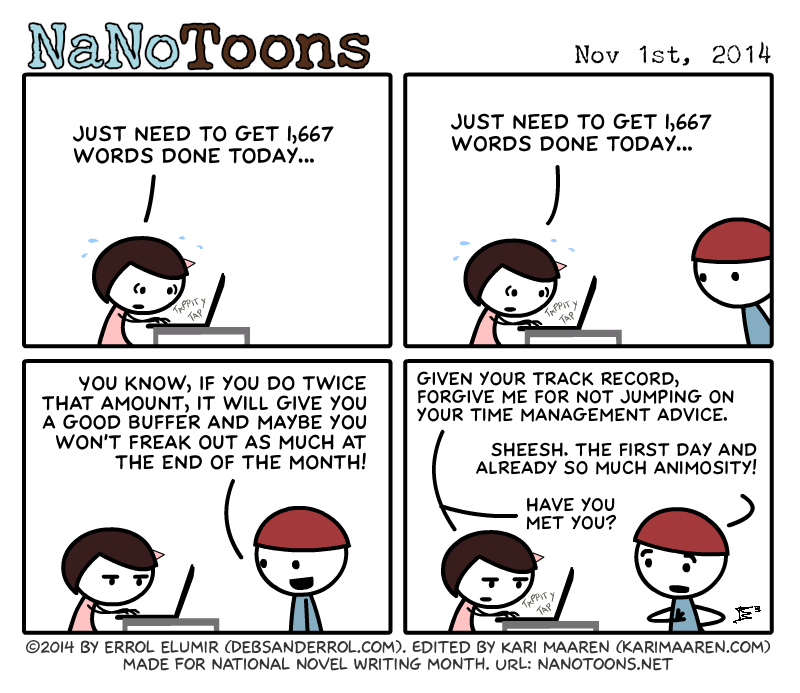 Did get a start – 800+ words, will work at it today. Currently standing on 1 889 and losing steam fast. Lettings things distract me now so I have and excuse to take a longer break… Going to push through. Want to do 3 200 by the end of the day to start the week off. Hold thumbs.